What is the benefit of surrender? If I surrender, doesn’t that mean I lose my identity? Or worse, won’t my identity be squashed or crushed in order to ensure I ‘fit’ into a preconceived notion of what it is to be part of ‘the group’? In a word, “No”. That is, not if you are surrendering to the One who created you in the first place. It is often said that no one knows you quite like your family. Actually, I’d take exception to that and clarify by saying, your family has the greatest potential to have the most entrenched concept of who you are, based on who you were at age 2, or 5 or 8, and which may not be relevant to who you are today. But when you surrender to the God who created you, and me, and the universe, you are surrendering to the One who truly does know your innermost being. Psalm 139 says it all: “You formed my inmost parts”. I’ll witness by way of a personal story, how one particular act of surrender has brought me the greatest joy I could ever know… a joy I most definitely would not have experienced had I put my will before the LORD’s in my life. The joy I speak of is my eight year old son. The act of surrender was accepting God’s call to have a child. That threw me for a loop! While I had grown accustomed to hearing God’s still small voice for a number of years, I’d never heard that message before! I immediately shot up to Him, “Well, LORD, do you think you could tell Alan (my husband)? From that time, my husband and I began to pray to seek God’s will and not our own, and decided we’d neither force the LORD’s hand nor block it. A few months later, when we were overseas visiting Hong Kong where we had friends, I was at a prayer meeting with two people I knew quiet well and a couple more who were strangers to me. At the end of our intercession, one of the women who was new to me turned to me. She was young in years, and fairly new to the LORD. Nervously, she said in a quiet voice that she had to tell me something. “You are going to have a baby,” she said. About fifteen months after that word was given to me, I was pregnant. A good friend who was a believer and a gynecologist warned that, at my age, I might miscarry. That was okay I thought, as this was the LORD’s child. At my age I had to have a test done for Downs syndrome. I should interject here to say that I have a large contingent in my family that is very bright. One fear I’d had for years was that if I ever had a child I might fail to bring one into the world that was ‘up to the mark’, and in fact, I might have a child that was a Downs baby; that was a private, deep-seated fear. Well, I had to have a medical test that measures something in the fetus’ neck; the larger the measurement the more chance the baby will be Downs. Lying on the bed in the hospital for the test, I watched as the numbers were crunching and they were off-the-scale high. I was scared at first, but then I remembered, ‘this is the LORD’s baby and He will create the baby He wants’. Immediately, I watched as the numbers dropped significantly and then settled. The test revealed that, factoring in my age, the calculations could not have given a better indication that the child was not going to be Downs. My point is, my greatest fear, when released to the LORD, was relieved. If the baby were Downs, I was ready to receive him. The child was God’s beautiful creation and I the blessed for having him. God was preparing me to accept His child, and continuing to teach me to surrender my will to His. There are a number of other blessings that have come from surrendering my will about having or not having a child. Some readers will have experienced joy, challenge, pain or all of the above as they’ve learned to surrender on this issue; each of us has a unique calling to walk out. But it is when we surrender that we become able to walk out the journey set for us. For my husband and I, the surrender of our wills meant allowing God to change our lifestyle and future forever by choosing to make us parents. That joy we would have missed if we’d not let him do His will. That joy has been the greatest joy of my life. What benefit is there in surrender? If we surrender our will to the Creator of the Universe, He can lead our lives to be more rewarding and fulfilling than we could ever imagine. I highly recommend the practice. And I’d love to hear stories from others who have surrendered. This entry was posted in Calling, Children, Family, God walk and tagged becoming parents, blessing, doing God's will, freedom of expression, God's will, hearing God's voice, journey of faith, maturity, spiritual journey, surrender by sarahtunauthor. Bookmark the permalink. Beautiful story, Sarah — and so encouraging! I think of Jesus in the garden, being honest about His own dread yet telling the Father that He would submit to His will no matter what. This applies in so many areas. That picture of Jordan is amazing. 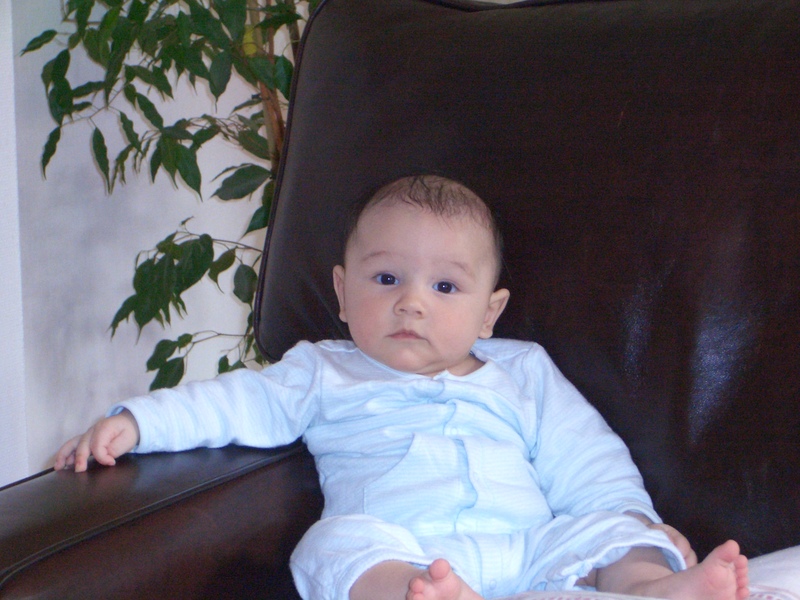 The way his arm is resting on the chair arm, and the look in his eyes of of incredible wisdom beyond his … months! You just know he is a kid that is going to go places!!! How good it is to receive your words; thank you. Yes, Jesus does model that perfect surrender and we can take heart that he, in his darkest hour, did ask Father God if it were possible please let the passion pass… but he also surrendered to His father’s will. In all of this we see a Savour who understands our fear, pain, dread and models how to trust and to persevere. As for my son, he is a joy. And I hope he bears the wisdom of ages as he matures. So far, I believe he’s doing well as an eight year old.